Janette and I stopped off at The Woods yesterday and quickly noticed something new on their tap list. They have always denoted which brews were available for growler fills with an asterisk, and some of their ciders on the list were now adorned with an asterisk. We pondered with each other on this a bit, as we had heard from many sources that the law was changing in WA to allow for cider growler fills…but no one had reported upon a date for this law to take effect. Well, I am happy to report that the date this law took effect was yesterday, June 12th, 2014! 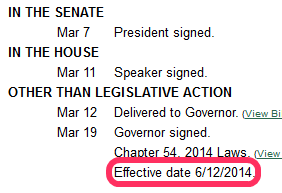 There it is, plain as can be right there on the Washington State Legislature’s website: Delivered to the Governor on March 11th, signed by the Governor on March 19th, effective on June 12th. Licensees holding either a license that permits or a license with an endorsement that permits the sale of beer to a purchaser in a container supplied by the licensee or a sanitary container brought to the premises by the purchaser and filled at the tap at the time of sale may similarly sell cider to a purchaser in such a container. We aren’t lawyers, but this appears to be some very plain language stating that if you have the necessary license/endorsement to sell growlers of beer, you now can also sell growlers of cider. Rejoice, cider lovers! I can hardly wait to get home and finish off the growler of Seattle Cider’s Gin Botanical Cider that we picked up yesterday! This entry was posted in Prednisone withdrawal by Zoloft weight gain. Bookmark the permalink.